Clive Bates has some strong words to say about the alleged public health community's scientific jiggery-pokery on snus. Readers of The Art of Suppression will recall the 'Tipp-Ex report'—the document published by the European Network for Smoking and Tobacco Prevention which systematically downplayed the importance of snus in bringing about Sweden's rock-bottom smoking rates. Such was the scramble to uphold the scientifically insupportable ban on the product that the text was changed even after the report had been published. Last week the Swedish newspaper Aftonbladet published a photo of one of the doctored pages. 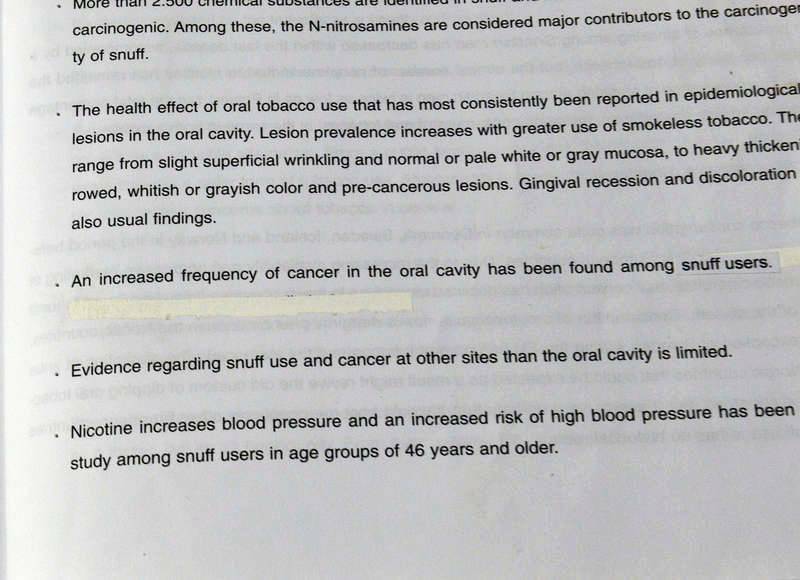 The original text (which can still be read when the text is held up to the light) made the truthful claim that smokeless tobacco has been found to increase the risk of oral cancer in America but that no strong evidence exists for users of smokeless tobacco (oral snuff) in Sweden. This is crucial because chewing tobacco in the USA is fundamentally different from Swedish snus—it has a fraction of the carcinogens, is cured differently, is in a bag and is used in a different fashion. Campaigning by so-called health groups to ban much less hazardous alternatives to smoking is dangerous, unethical, lazy with facts and utterly without regard for the people they are supposedly trying to help – see my detailed post Death by regulation. But they go to a whole new level of awfulness – evil maybe – when it is done with deliberate deception and falsification. When that happens, it becomes something much darker – in fact as bad, and as deadly, as the worst excesses of tobacco industry PR. 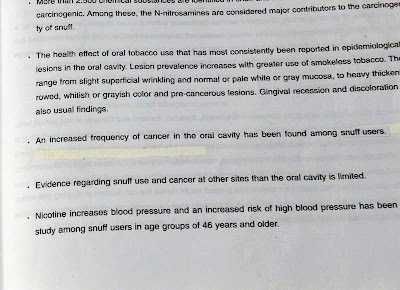 And that is what happened – they used Tipp-ex to erase inconvenient truths in a report intended to inform science based policy on alternatives to smoking. I’m disgusted with these people. While you consider what has happened here, just imagine the tsunami of righteous outrage there would be if a tobacco company or those of us who support the widespread introduction of much less hazardous alternative to smoking had done similar. Bates is, of course, in no way associated with said tobacco companies. He is Deborah Arnott's predecessor at ASH (UK) and has no reason to speak out against the anti-smoking lobby other than a sincere concern for public health. Although I greatly respect him for burning his bridges with the tobacco control lobby on a point of principle, I do not agree with him on every issue, far from it. I don't accept that the UK smoking ban was a proportionate response to the feeble evidence on secondhand smoke, for example, and I reject the whole concept of health being public in the first place. I support the re-legalisation of snus because individuals have a right to consume any such product, especially one which is vastly less dangerous than the one they are currently consuming. Re-legalisation will almost certainly reduce rates of smoking, lung cancer and heart disease at the population level, and that is a very good thing, but that is not really my business and it is not yours either. However, the distinction between the philosophies of individual sovereignty and public health are almost irrelevant in the case of snus since re-legalisation will clearly benefit both. It has been obvious for a very long time that these people care no more about health than they do about liberty. The shame is on them.